A recent report by the Private Equity Growth Capital Council stated that private equity firms in Massachusetts invested more than $6 billion in Mass-based companies in 2010, ranking number six in terms of deal value1. That money was invested in 57 companies – an average of $105+ million to each company. Now, I don’t know about you, but where I’m from, that’s a LOT of money. But if you’re an investor, it’s just another day in the life; they want to invest the big bucks in companies they believe in. So, the million (or should I say, 100 million) dollar question is, how do you find the right companies to invest in? Deal sourcing – or how private equity (PE) firms get their deals – is somewhat of an art. It’s about finding the perfect match between a PE firm and a company or entrepreneur, whether they are looking to start a business or need additional funding injections in order to expand. All deals are unique, and they can come from many different sources. If you’re on the entrepreneurial side of things, you may hear a lot of discouraging facts (ex: less than 1% of entrepreneurs actually receive funding2), which may very well be true. But, if there were a more organized way of PEs finding the kinds of entrepreneurs and small businesses they’re interested in (and PEs were committed to it), this number could go up, and the deal sourcing process would be made that much easier. As many of us know, investors are BUSY people. They don’t have the time to sit around and sift through all potential business deals and/or executive summaries they receive on a daily basis. They’re finding out about prospective companies, most likely, through their network and from trusted sources2. The last thing an investor wants to find out is that the “next big thing” was funded by their competitor. So it’s supremely important for them to stay organized and be aware of the rising stars in the entrepreneurial world. How can investors and PE firms do this? They can start by organizing their network and contacts in a way that will provide easy access to the people and potential businesses investors need to be in touch with. In the busy life of an investor, useful information is bound to get lost in the shuffle. Imagine a database through which one could categorize and keep track of all of their business contacts, and the interactions between them – and how much easier deal sourcing could be through the use of such a database! Do you think this sort of program is just another unachievable dream? Think again! 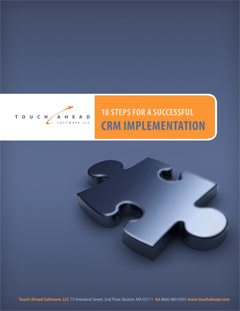 CRMs – or Customer Relationship Management – are exactly such databases. They help people like venture capitalists manage the interactions they have with clients and businesses they may be interested in investing in. This means keeping tabs on entrepreneurs you may have noticed at a recent networking event, staying in touch with trusted contacts, and knowing when to make a move – before the competition does. Of course, this doesn’t all happen with the click of a button, and it does require a certain amount of effort on the investor’s part. However, with the right level of dedication, the use of a CRM can produce great results when it comes to deal sourcing, and can put your PE firm one touch ahead of the rest. Private equity investment tops $6b in Mass. This entry was posted in Blog, News and tagged advantages, business strategy, CRM, EquityTouch, private equity, SaaS, touch, venture capital. Bookmark the permalink.